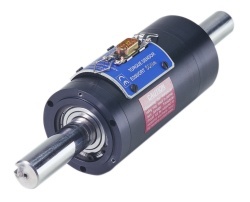 An established technology, Optical Rotary Torque sensors use a pair of gratings attached a short distance apart on a strain-sensitive shaft to modulate a light source. As torque is applied to the shaft, a slight twist results which changes the alignment of the gratings and thus varies the light transmitted through to a detector. While simple in concept, the Optical devices tend to be more costly than competing technologies. For most standard applications, therefore, sensors based on other concepts - such as TorqSense - tend to be preferred. But when the demand is for low torque and/or high bandwidth, the alternative options quickly drop out leaving Optical's as the only viable solution.